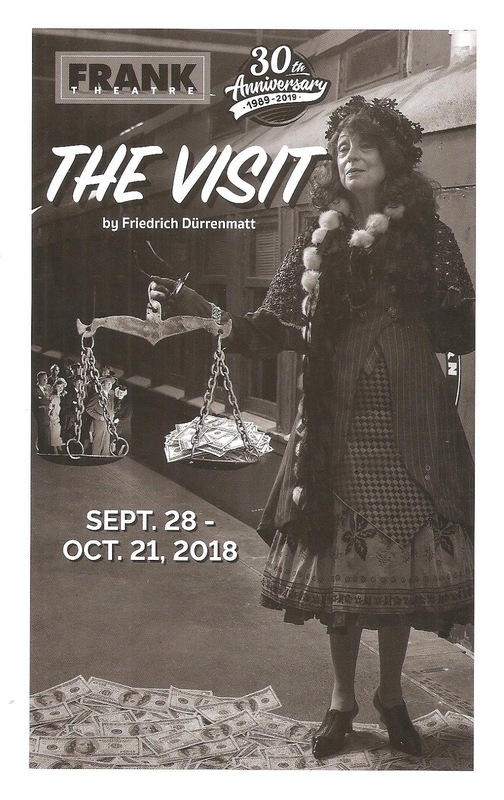 To open their 30th season, intrepid nomadic #TCTheater company Frank Theatre is bringing us The Visit in the Minnesota Transportation Museum. This is actually the second play I've seen in this unique and super cool venue (see also Wayward and Mission's co-production of Ghost Train). Both plays are set (at least partly) in a train station, so the museum is a perfect location. Filled with vintage train equipment and displays (which you can wander through before the show and at intermission), the museum is fascinating but also kind of dark and creepy and cold, and smells a little like a garage. Which is the perfect atmosphere for Swiss playwright Friedrich Dürrenmatt's absurd "tragicomic" play. This is a very Frank play, with a huge and talented cast and great commitment to the highly stylized design and tone of the play. The Visit is set in the small depressed town of Güllen (which I tell you just so I have another excuse to use umlauts, as Frank also seemed to enjoy in the set design, although the German nerd in me cringed at the sight of an e-umlaut - not a thing). Local businesses have closed and express trains don't stop there, until former resident and now über wealthy Claire (the divine Katherine Ferrand) returns to much fanfare. The townspeople, including the pompous mayor (Gary Briggle), pastor (Vinecia Coleman), and teacher (Heather Bunch) are hoping she'll invest in their town to return it to its former glory. Which is exactly what she plans to do, and she only wants one thing in exchange: the death of her childhood sweetheart Anton (Mark Rhein), who denied he was the father of her baby, sending her off to a life of poverty and prostitution. She's already gotten her revenge against the two lying witnesses (Mohamed Yabdri and Gabriel Murphy) in the most bizarre way. The people protest and argue against this murderous condition, but secretly begin buying things on credit, as if expecting a great windfall. Anton sees the writing on the wall, especially when his wife (Kirby Bennett) and children (Allison Witham and Sulia Rose Altenberg) show up in swanky new clothes. Anton has become a respected citizen, well-liked by the town, but they're willing to sell him out for a billion marks. The question is: is this justice, or vengeance, or just plain greed? Frank has been trying to produce this play for a few years and been delayed by various factors. The timing of its eventual production is quite interesting. The woman next to me whispered to her companion (several times actually) that "this is just like the Kavanaugh hearing." A woman who was wronged as a teenager is now telling the world her story and asking for justice, for the perpetrator to finally take responsibility for what he did so many years ago. Yet another example of art imitating life imitating art. The perfect backdrop of the train museum is enhanced by Joe Stanley's scenery design, which incorporates some of the old trains in the museum, so that it really feels like you're in a train station. A small room has been built on one side of the staging area, with a balcony from which Claire can oversee the town. Anton's shop is represented by a few set pieces rolled in, and the changing signage for Güllen represents the changing status of the town. 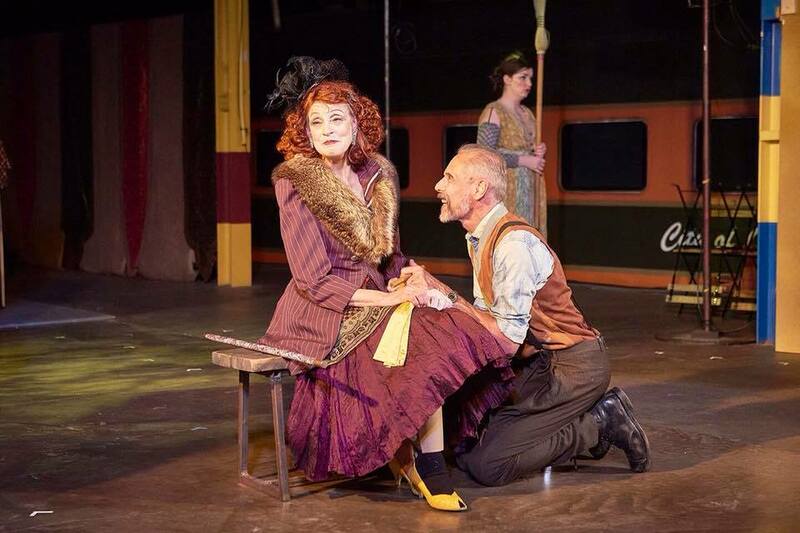 Kathy Kohl's costume design fits the absurdity of the play, and Claire's dresses are weirdly gorgeous. When the second act opened on her sitting in her wedding gown (which I think had a skirt made of white gloves), she looked like a perfect life-sized doll. Exaggerated hair and make-up complete the look. 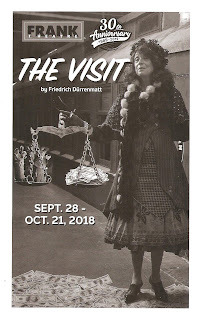 The Visit continues through October 21 at the Minnesota Transportation Museum, off 35E just north of downtown St. Paul. Allow some extra time before the show to wander through the exhibits. Morning people be warned - evening shows begin at 8 pm and the runtime is close to 3 hours, so you might want to consider a matinee (I'll be taking my own advice for all future Frank shows).